Our coach arrived in a large car park with people waving and cheering – a great welcome after a long journey. I smiled at a slightly grubby looking woman who gave me a hug and thanked me for coming; she has been camping out at Barton Moss for the last 2 months over winter. People of all ages and descriptions arrived in coaches, minibuses, cars, on foot, in wheelchairs. The buzz and the atmosphere grew as we started to march together with banners waving, singing and shouting. Gayser Frackman appeared at regular intervals along the way, perched up high, shouting his support with drum in hand. The honking of horns from vehicles slowed by the march showed overwhelming support. We could see from the banners that many locals were present as well as those from round the country. Just outside the camp, by the roadside we stopped to listen to speakers, music and messages of solidarity before walking down the muddy track to the drill site. If press interest was based on numbers of people then you would have heard much more about this Solidarity Sunday with a gathering of hundreds. But when the media focuses on clashes between protestors and police, a quiet gathering may almost go unnoticed. Walking back from the drill site I was full of admiration for the people at the Barton Moss anti-fracking camp. It is stretched out along a muddy verge beside a single track road and the tents look beaten up by the recent weather. Yet the camp appeared extremely well organised; hot food was being given out and there was a constant flow of people from the tea tent. People are living there and doing so because of the strength of their feelings. They are there for us, as well as themselves because if fracking is allowed it will affect us all. My motivation for sitting on a coach for 8 hours on a Sunday came from my outrage at Cameron’s recent announcement that he would be bribing Councils (giving them a financial share of the business rates) to agree Planning for hydraulic fracturing, or ‘fracking’. Big business is heavily influencing our government, which is why Cameron and his allies are going ‘all out’ for the dash for gas. Why else would a ‘Green’ government make fracking so easy and allow the potential for low carbon and renewables to fall by the wayside. I don’t use the word ‘bribe’ lightly, yet how else can the government’s actions be seen? Councils are strapped for cash and are really struggling to provide vital support and services for the most vulnerable people in our communities. So, they would consider carefully, any offer of cash. But what they also need to consider is how these communities could be destroyed by the industrialisation of the landscape, the risk of damage to human and livestock health and the further pollution of the environment. Now, and in decades to come. So I travelled to Barton Moss, with nearly 50 others from Bristol and Somerset to show Solidarity with people in a part of the country I previously thought I had no connection with. The connection is that we are voicing our opposition to fracking, and unless we stand together to show our opposition, people will not listen and the government will not stop. This is your chance to actively show you care and that you are will to take a stand with communities on the frontline of fracking. If you can’t go yourself, why not donate towards someone else? The government has gone on a Fracking charm offensive today (13th Jan 2014) with the Prime Minister saying that the government is “going all out for shale” and has announced that councils can retain all of the business rates raised by from fracking sites. This has been widely reported as a “bribe” in the press. (We have been here before). “As soon as a well is dug the local community should get £100,000”. This is not correct. It is only when a well is hydraulically fractured which may not happen at all for exploratory wells and may not happen for some years for coalbed methane production wells. Further this is a voluntary payment by companies which are members of the UK Onshore Operators Group. We have asked UKOOG who their members are. No reply. That the shale industry will “bring 74,000 jobs” – highly debatable. That shale gas will “Give us cheaper energy”. This is a real howler. Lord Stern (LSE), Lord Browne (Chairman of Cuadrilla for heaven’s sake) and the Department of Energy’s Chief Scientific Adviser, and many others, all say that shale gas will not bring down energy prices in the UK. That shale gas will “Increase our energy security “. This is a mirage. Shale gas may offer a short-term supply of gas but then what? That is not energy security. Further it does so at the expense of climate security and will leave behind a countryside full of stranded and worthless assets. The government’s statutory adviser, the Climate Change Committee, estimates that the dash for gas is going to cost us (not save us) many billions of pounds. “I want us to get on board this change that is doing so much good and bringing so much benefit to North America. I want us to benefit from it here as well.” Who on Earth is advising the Prime Minister? 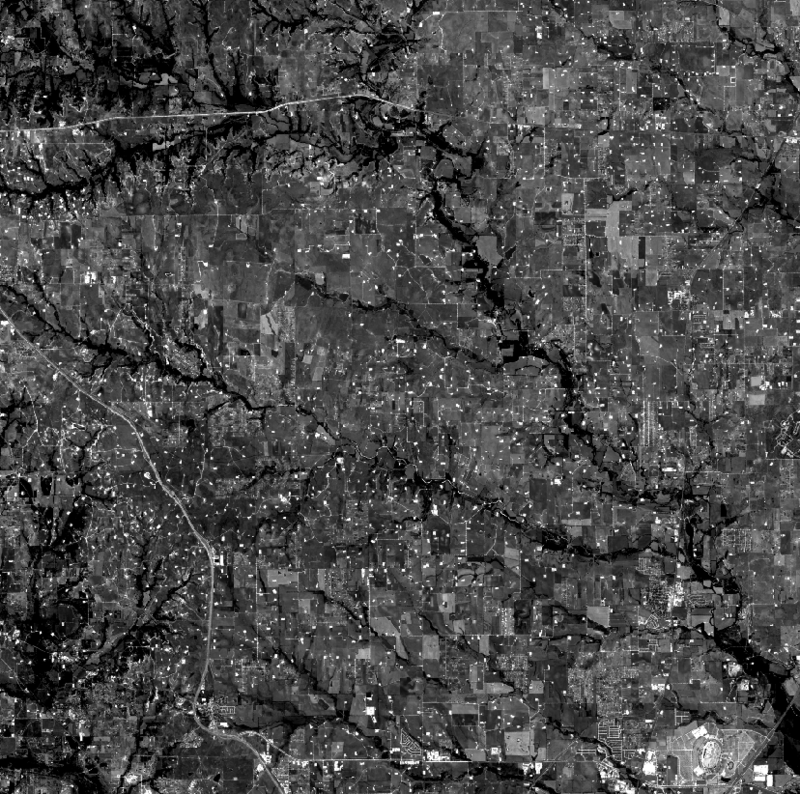 This is what the Barnett Shale just outside Dallas looks like from space. The image is nearly 30 km across. Not all of those little white dots are drilling pads but a huge number of them are. The others are people’s houses. Drilling pads to the west of Dallas, Landsat 8, 31 August 2013. Some well sites are immediately adjacent to people’s homes. 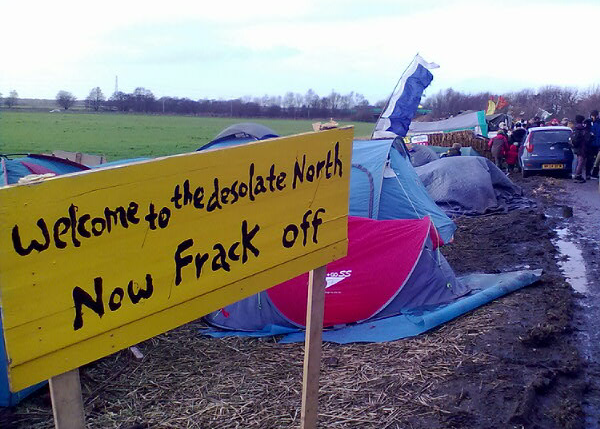 Is this really what Cameron wants Britain to look like, a great mass of fracking pads? Well the people of Dallas (Oil City) are getting fed up with it and in December the City Council banned fracking within 1,500 feet of homes, schools, churches and protected areas. 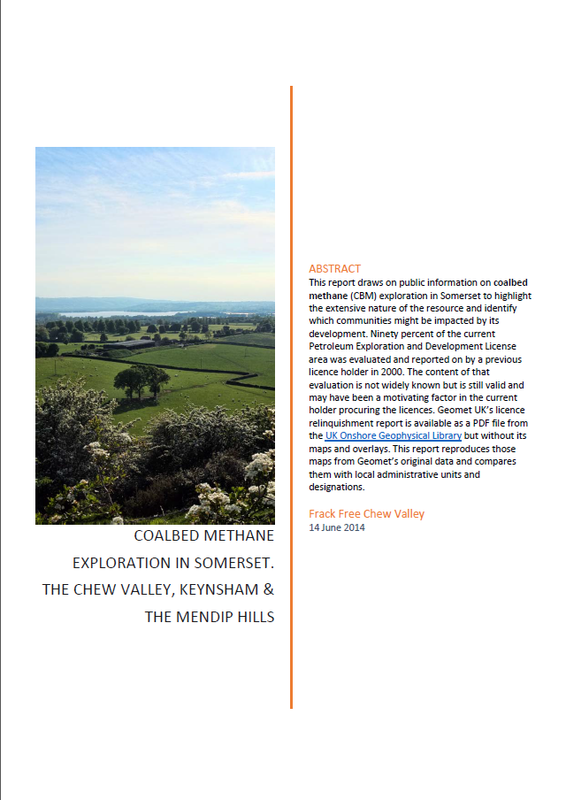 There are no such restrictions in the UK and UK Methane boasted at the debate in Bath that they have previously drilled within 50m (150 feet) of residences. Politicians such as Mr Cameron, Mr Fallon, Mr Lilley and Mr Rees-Mogg continue to claim that shale gas will give us cheaper energy prices, whereas Lord Stern and many others call this “baseless economics”. Politicians are welcome to their own opinions and policies but they are not entitled to their own facts. The coalition government is willfully ignoring advice from their own advisers to concoct a pro-shale policy.